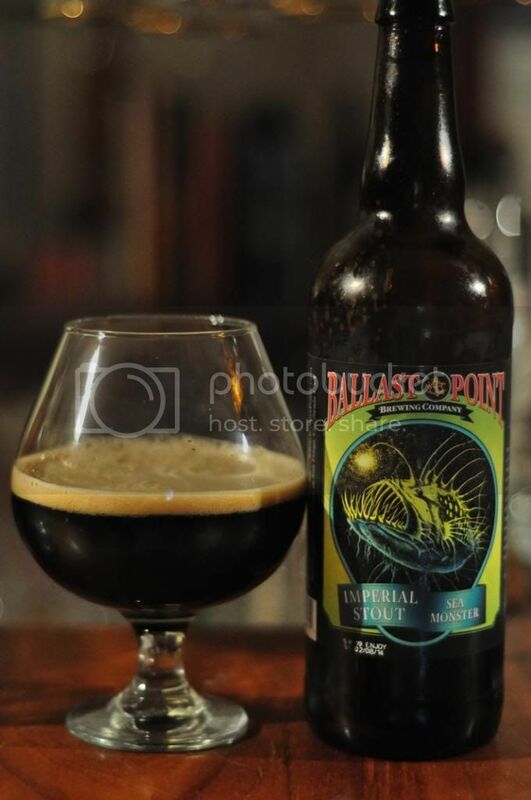 Here tonight we have the Imperial Stout from Ballast Point. It's called Sea Monster and judging on the other Ballast Point beers I've had I'm in for a real treat. Everything I've had from them I've really enjoyed! Ballast Point have some of the coolest beer labels and glassware of any brewery out there. Sea Monster certainly has a label that stands up the rap I gave them and I think a glass would look absolutely stunning with stout in it. Anyway I really looking forward to this and can't wait to see how this compares to their other dark beers, Black Marlin Porter is one of my favourite beers! Could you ask for a better looking stout? Sea Monster pours a thick looking, jet black colour. It has a relatively thin looking, khaki head. The retention however from this head is excellent for the style. There is no lacing to comment on, however at the end of drinking the glass is noticeably dirty... I don't know what else to say about it, it's a fantastic looking stout! Onto the nose and Ballast Point delivers again with a fantastic nose. There is plenty of coffee and roasted malt aromas upfront. It's a strong assault on the senses which is carried on even as the beer warms by some nice bitter hops. This is exactly what I expect from an Imperial Stout! There is one thing that I am not disappointed to see missing... raw alcohol. I can't smell any now, hopefully I can taste any either. This could be a controversial call but I think this is my all-time favourite Imperial Stout! Maybe it's because it's been ages since I've had one, but this was sensational! I can't recommend trying this highly enough! Seriously guys if you like Imperial Stouts this is a must try, it's one of the most balanced stouts that I can remember drinking.